Lauryn Hill announces 20th anniversary tour for "Miseducation"
Los Angeles, CA (June 18, 2018) – Multiple GRAMMY® Award winner Ms. Lauryn Hill has announced special guests joining the North American leg of her highly-anticipated The Miseducation of Lauryn Hill World Tour 2018. Produced by Live Nation, and kicking off July 5, the outing will feature varied support on each date. The full list of artists performing at various dates of the tour include NAS, M.I.A., Dave Chappelle, Santigold, A$AP Rocky, SZA, Big Boi, De La Soul, Busta Rhymes, Dave East, Jo Mersa Marley, Talib Kweli, Bambaata Marley, Shabazz Palaces, Patoranking, Tierra Whack, Protoje, Kelela, Victory, Raury, Iman Omari and more. The full routing with support details can be found below. Ms. Lauryn Hill has also revealed she will be adding a Los Angeles date at the Hollywood Bowl on September 18th featuring comedic powerhouse Dave Chappelle where De La Soul will also lend support. Citi® is the official presale credit card of The Miseducation of Lauryn Hill World Tour 2018. As such, Citi cardmembers will have access to purchase presale tickets for the Los Angeles show on Tuesday, June 19th at 10am local time until Thursday, June 21st at 10pm local time through Citi’s Private Pass® program. For complete pre-sale details visit https://www.citiprivatepass.com/. Tickets for the Hollywood Bowl show go on sale to the general public starting at 10am local time. 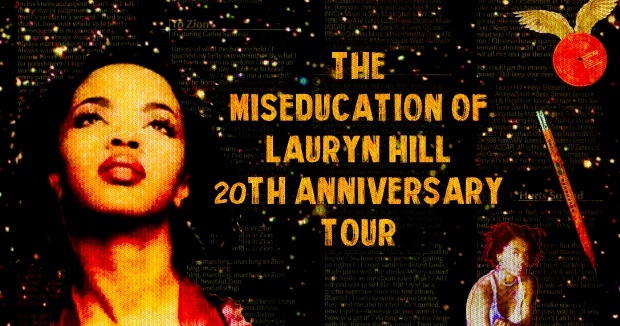 Tickets and VIP experiences for all other dates are currently on sale at MsLaurynHill.com.